As February is coming to an end winter is still with us despite improving weather conditions. Although I have seen Horned Larks it is still a good month or so before more migrants arrive so, I will be sticking with winter birds for the next little while. 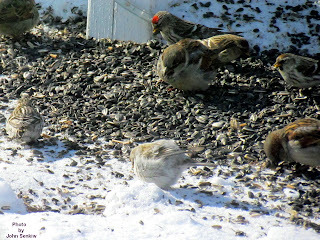 To that end I have spent quite a bit of time photographing the Redpolls in our yard especially the Hoary. One of the group of birds that I have not covered as of yet are the crossbills. There are four species in Europe but only two in North America, the Red Crossbill and White Winged Crossbill, both of which occur locally. Both species are sparrow-sized reddish birds with black wings and unique sharply pointed bills whose tips cross over each other when the bill is closed. The bills are especially designed to pry the seeds out of the cones of conifers like pine and spruce. The Red Crossbill is slightly larger of the two with a heavier and more powerful bill. As a result the Red Crossbill tends to feed on larger and tougher cones such as pine while the White Winged prefers spruce but neither is overly picky and any cone will do. The Red Crossbill is much more widespread covering all of North America including parts of Mexico. There are about nine different and distinct subspecies that some taxonomists feel just might be nine different species altogether. If that proves to be the case then there will be ten different species of crossbills in North America. On the other hand, the White Winged shows no variation in different regions and therefore will in all probability remain as one species. Also its distribution is much more limited being confined to Canada and Alaska except in the winter when some migration takes place to the North Central and Eastern US. Even though the crossbills are not really migratory they are wanderers constantly on the move searching for food, except during nesting season, making their appearance in any one place highly unpredictable. Locally, both species can only be expected during the winter or spring. The males of both species are similar but with close examination can be easily distinguished from one another. The Red Crossbill's body is a deep dull red with pure black wings. Some subspecies, however, do have faint white wing bars. The White Winged is more of a pink or rosy colour with two very pronounced white bars on its black wings. Males and females are different. I have seen both species in our yard but the Red is the more common. One of my earliest experiences with crossbills was in the Black Hills of South Dakota. We were at the Mt. Rushmore monument standing in the shade of some pine trees hiding from the midday sun when we noticed that we were being repeatedly sprinkled with scales from pine cones. We could also hear faint but constant crackling sounds coming from the trees above. The mystery was solved when we looked up and saw a small flock of Red Crossbills overhead feeding on the seeds of pine cones. This week I am including two pictures. 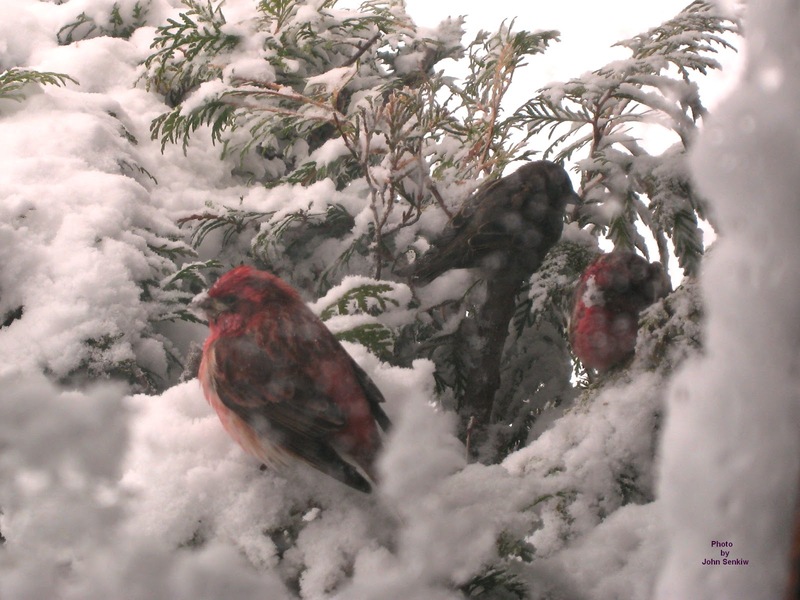 One is of two male and one female Red Crossbills sitting on a cedar just outside our window hiding from the spring storm in April of 2012. (The storm had forced a number of birds to land in our yard including a flock of Red Crossbills.) 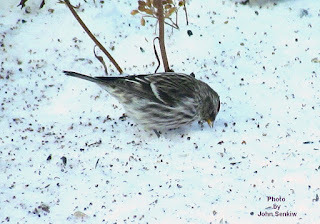 The other photo is of the Hoary Redpoll feeding on the ground on spilled black oil seeds along with House Sparrows and Common Redpolls. It is shown all fluffed out like a little fur ball trying to get some warmth in the morning sun as it fed. In the same sense that Remembrance Day, to me, is the unofficial start of winter Valentine's Day is the unofficial end of winter. Yes, there will be more frigid temperatures to come and probably some more significant snowfall but the worst is over. Days are noticeably longer; cold spells are shorter; warm spells more frequent; temperatures are rising overall. 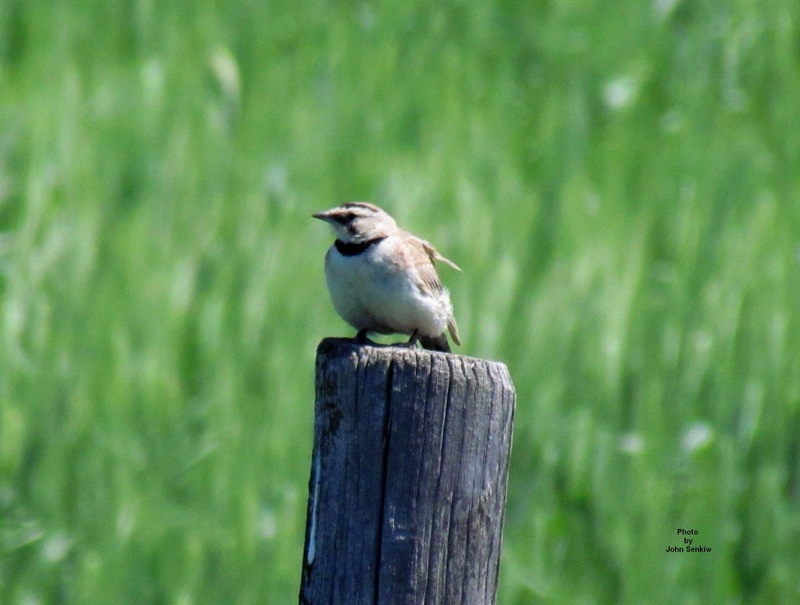 Finally, our first spring birds, the Horned Larks, are back. In the meantime it is back to our winter birds. As I have mentioned previously we have had a Hoary Redpoll in our yard this year mixed in with the hordes of Common Redpolls. 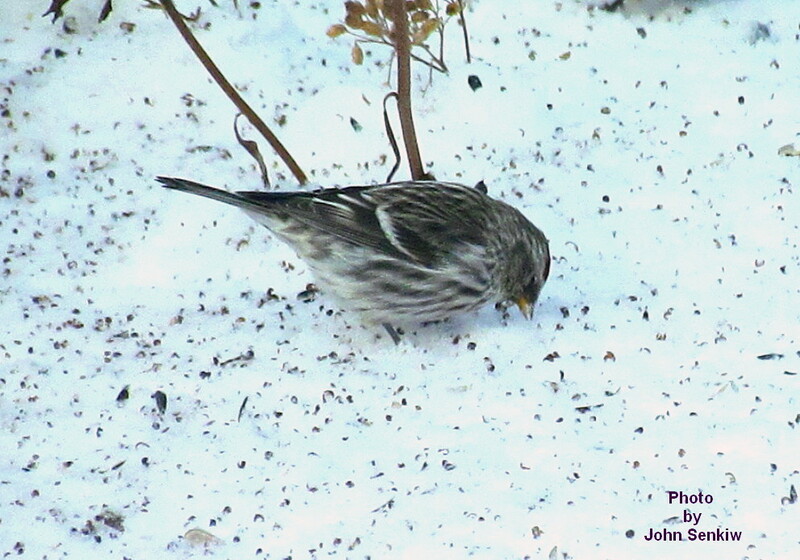 The Hoary Redpoll, like the Common, is circumpolar in distribution but, unlike the Common, it tends to stay in the Arctic all year round (hence its European name - the Arctic Redpoll). Although it is essentially non-migratory some individuals do fly to our area with flocks of Common Redpolls. The Hoary is a washed out or frosty version of the Common Redpoll and sometimes is hard to differentiate from a pale Common Redpoll. Even experts will, at times, hesitate to positively identify one in a mixed flock of Redpolls. 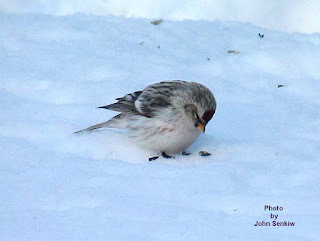 For this reason the two species were, for awhile, lumped into one species - the Redpoll. 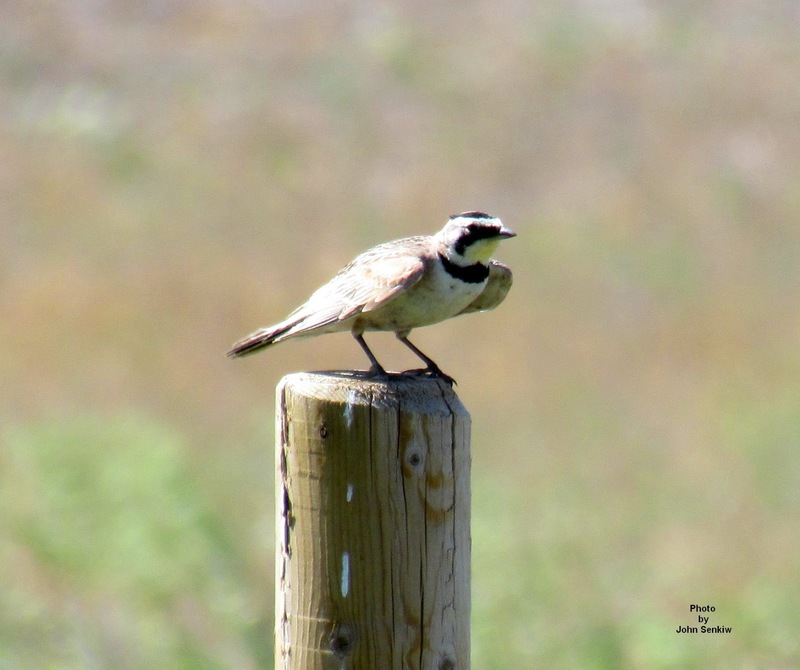 Some older bird books will list the two as one species. There are several field marks that can be used to separate the two species. I will refer to only three and all three should be seen before safely identifying the bird. First, the bill is stubbier with a straight culmen (top edge of the bill). This field mark is subtle to say the least and photos of both species for comparison is a good way to go about it. Second, The flanks of the Hoary are only faintly striped, if at all, while the flanks of the Common are boldly striped. Third, The rump and under tail coverts of the Hoary are not striped and almost a pure white while the same areas in the Common are striped and look much darker. With good binoculars, a sharp eye and a lot of patience these last two field marks are very useful in identifying the Hoary Redpoll. Until this morning I was unable to get a photo of the Hoary Redpoll because it was constantly moving and "disappearing" among the Common Redpolls. This morning it was cooperative and I was able to get several good shots of it. Two of the photos show full body profiles of a Common and Hoary Redpoll highlighting the differences in the striping on the flanks and to a lesser extent the shape of the bill. 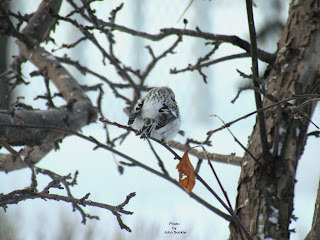 The third photo is a rear view of a Hoary Redpoll sunning itself early in the morning. It was all fluffed out thus clearly exposing the rump and to a lesser extent the under tail coverts. In this photo the "frostiness" of the bird is emphasized. Finally, this particular bird was treated rather harshly by the other Redpolls and was constantly chased away from the feeders by them. As a result it was isolated and fed a respectable distance away from the Common Redpolls. This interaction convinced us that it was indeed a different species - the Hoary Redpoll.